In the year since Rosa’s Fresh Pizza started selling dollar slices in downtown Philadelphia something wonderful has happened. After witnessing the success of the dollar pizza stores in Manhattan, 27-year-old Mason Wartman left his job on Wall Street to move back home to open one of his own. What he didn’t know at the time is that his pizza joint would become a bastion of kindness for customers paying it forward by buying slices for others. In March 2014, a customer asked he could buy a slice for someone in need. “I ran out and got a Post-It and wrote a smiley face on it and stuck it up,” Wartman told WPVI News. 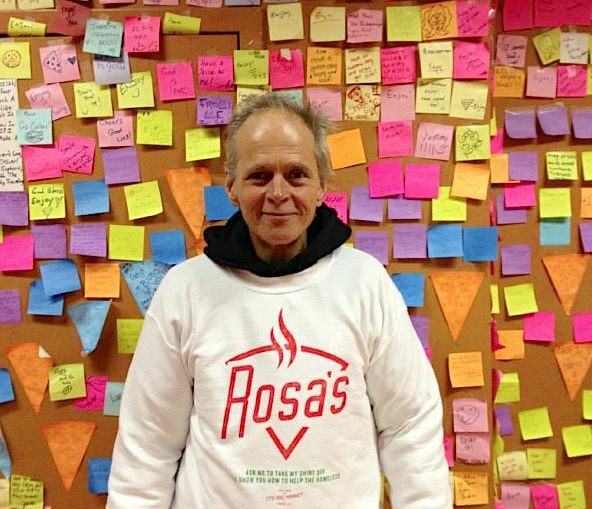 Today, hanging all over the walls of Rosa’s, which was named after his mother, are neon post-it notes from people who have bought slices of the handmade pizza to be given to the hungry. The shop on 11th Street gives away an average of more than 40 slices of pizza every day now, and warmly welcomes any homeless person to sit down, enjoy the music and dine for free. More than 8,000 of the cheese slices, which have been lauded as delicious, have been donated in the nine months since the program was born. Wartman started selling t-shirts and touts seven slices being donated for every sale. The apparel, which includes sweatshirts, all have a large tag sewn on the underside that details homeless resources in the city, such as shelter hours and locations, and info about a free computer lab. The public can pre-purchase a hot slice of pizza for one of the many homeless Philadelphians right on their website. Originally posted by Good News Network – January 11, 2015Photo from Rosa’s Facebook Page.